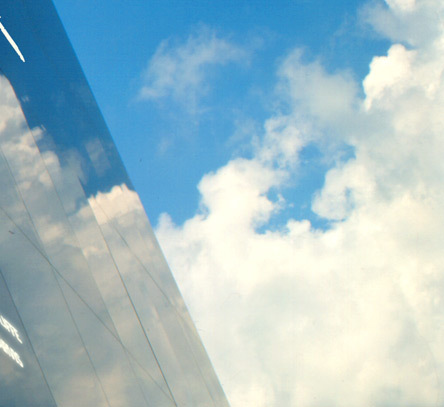 Tilted mirror-polished black granite surface automatically rotates to face away from sun in order to reflect the sky; mirrors reflect sunlight through names cut through the granite surface, filled with acrylic diffusing medium, causing them to glow against the reflected sky. 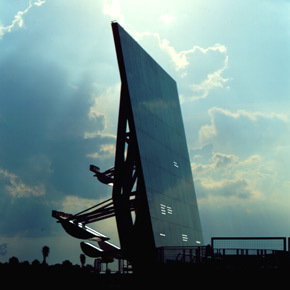 Located at the entrance of NASA's public visitor's complex at Kennedy Space Center, the Astronauts Memorial commemorates the pioneering lives of the fourteen American astronauts who have died in the line of duty. 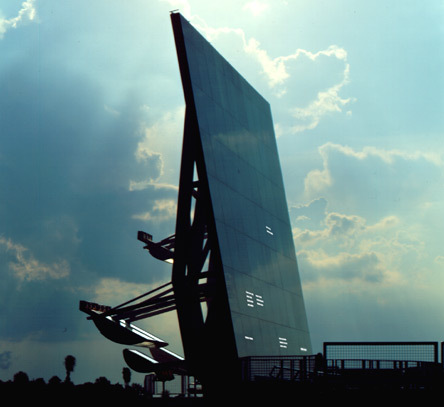 The Memorial consists of a 62 ft. high polished granite and welded steel wall that rotates and tilts to precisely track the sun through the course of each day. 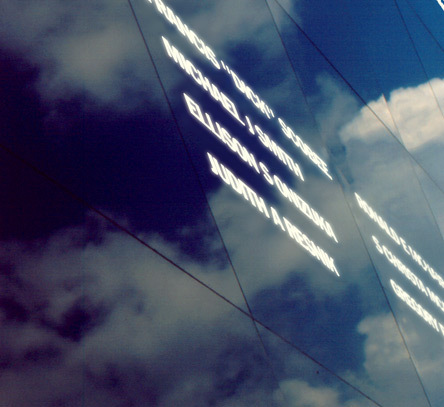 Attached to the back of the wall are pivoting mirrors that reflect the intensified sunlight through the letters of the astronauts' names—which are cut completely through the 3" thick stone monolith and filled with glass. 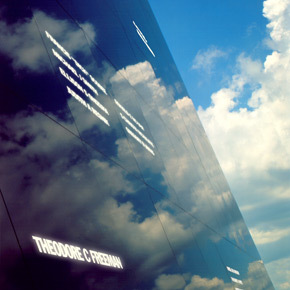 As the visitor approaches, the brilliant names appear to float eternally against the monumental reflection of the ever-changing Florida sky above. 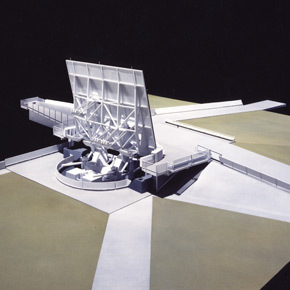 The Memorial's unusual optical systems were developed with the help of Stanford University's Astronomy Department. 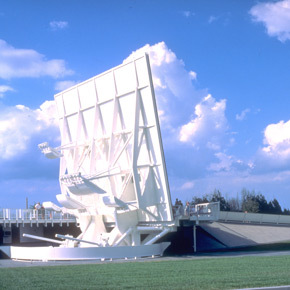 Tracking calibration and mechanical dampening software, beam focus, optical diffusion, and heat mitigation systems all incorporate technical achievements of the space program itself. 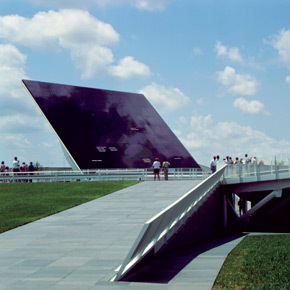 The project's computer control systems were engineered and supplied by a consortium of McDonnell Douglas and Hewlett Packard and transportation systems specialists VSL Corporation provided principal engineering support and fabrication services for the Memorial's many mechanical components. 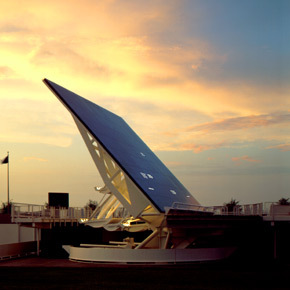 Two immense screw jacks tilt the granite monolith back or forth depending on the height of the sun above the horizon; a 110,000 lb keel at its base counters gravitational and wind forces acting to overturn the tilting structure. 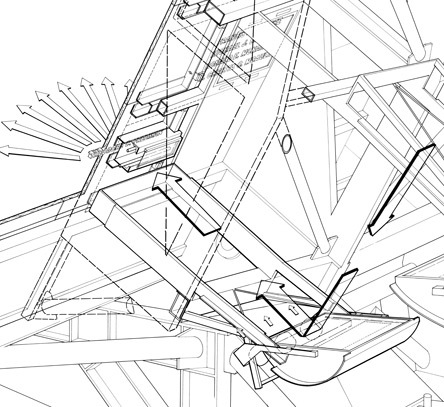 As the sun moves from east to west each day a gear mechanism rotates the entire Memorial assembly in plan around one of the largest slewing rings ever manufactured. To frame nature does not mean to capture it, point at it, to represent it, or even to symbolize some aspect of it; to frame it is to gather it into an engaging relationship with the observer, “to tease it into unhiddeness,” so that nature reveals its own story in a way that captures or points back at the observer. A framed portion of the sky, and the efforts expended to “gather” it mirrors the efforts of those astronauts who gave their lives to understand it. Here technology is not only the means of revealing but an integral part of the equation revealed—an equation which places man into nature. Technology holds the mirror in which we can see this relationship.